ASUS Prime is the next evolution of the ASUS motherboard, born of a pedigree that stretches back to 1989. Our team of world-class engineers are passionate about empowering everyone to enjoy the benefits of customization and tuning, and the driving force behind the development of Prime is to make advanced enthusiast controls easily accessible - maximizing performance, stability and compatibility for the very best DIY PC experiences. Simply stated: it's time for Prime. ASUS is the world's foremost motherboard manufacturer, renowned for our unique Design Thinking approach. Our exhaustive testing exceeds industry standards, supported by high-quality components for exceptional real-world protection. Our motherboards are proven to be compatible with more than 1,000 components and devices, and each new model undergoes a minimum of 8,000 hours of strict validation. ASUS gives you the peace of mind of knowing that your motherboard is fit for all environments and applications. By choosing ASUS, you also gain the freedom to select outstanding component options, for trouble-free DIY experiences. Hardware safeguards to ensure long-term durability. Industry-leading DDR4 memory compatibility for best flexibility and reassurance. Compatibility with a range of CPUs, memory modules, graphics cards and more. Extensive testing with latest components for enhanced reliability, compatibility and safety. 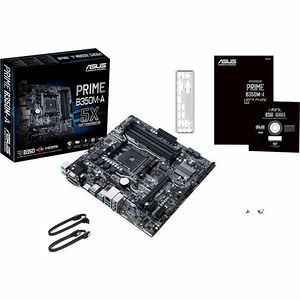 PRIME B350 series motherboards are engineered with industry-leading 5X Protection III, employing the finest components, excellent circuit design, and exacting standards to guarantee the quality and long-term durability of your motherboard. That means exceptional protection and stability for your build - thanks to decades of engineering experience from the world's leading motherboard brand. SafeSlot Core is the ASUS-exclusive PCIe slot. Featuring a fortified design that's anchored to the motherboard by a special hook, Safeslot Core provides 1.6x stronger retention and 1.3x greater shearing resistance than standard expansion slots. ASUS Prime motherboards have strengthened solder points around both the PCIe and DIMM pins. ASUS LANGuard is hardware-level networking protection that employs signal-coupling technology and premium anti-EMI surface-mounted capacitors to ensure a more reliable connection and better throughput, plus electrostatically guarded and surge-protected components for greater tolerance to static electricity and improved protection against surges.